Elegantly responding to the confluence of the Chicago River, Wolf Point West’s design maximizes views in every direction rising 46 stories high. Residents will enjoy spectacular views from floor-to-ceiling windows, as well as inset balconies on select units. These brand new, stunning River North apartments feature refined architectural detailing with duotone, soft-close cabinetry, quartz countertops, undermount sinks and wood grained flooring. Wolf Point West policy of continual attention to design and construction requires that all specific designs, plans, specifications, sizes, features, dimensions, materials, and prices are subject to change without notice. Rooms, dimensions, and square footage are only approximations and are subject to change without notice. Each amenity at Wolf Point West has been thoughtfully designed to deliver both remarkable beauty and flawless functionality. 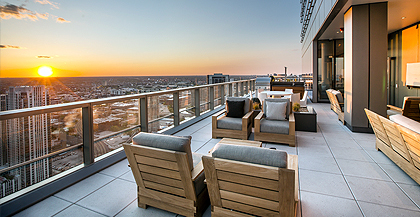 The top floor Sky Lounge offers residents and their guests dramatic views of the city; a luxury often reserved for penthouse owners. Amenity spaces feature an eclectic blend of mid-century modern design, rich tones, elegant materials, signature works of art and classic Knoll furnishings. Wrapped in an expansive sundeck with cabanas and mesh sun loungers, our resident pool captivates with elegance and riverfront views. With calming views of the water, residents can savor their morning coffee or relax with an evening cocktail in the comfort of our stylish, riverfront lounge. Crisp summer evenings and cooler months will draw residents to our outdoor hot tub. Immerse yourself in warmth with the soothing sounds of the Chicago river. Challenge your swing alongside PGA Champions. Our state-of-the-art Golf Simulator offers a variety of legendary courses to advance your golf game. Our sleek, modern business center offers a conference area and multiple glass front private study rooms. Equipped with 60” LED Smart TVs, integrated power and open work collaborative tables. Unwind in the Club Room at Wolf Point West, appointed with built-in millwork, leather tufted furniture and featuring a state-of-the-art Golf Simulator. Bring your bike! As one of the best cycling cities in the US, Chicago boasts more than 200 miles of bike lanes including the 18.5 mile Lakefront Trail. Wolf Point West provides residents with storage, a bike wash and workshop. Adjacent to our jewel box lobby and flowing directly into our elegant pool area, you’ll find the River Lounge. Comfortable furnishings by Baker, Chai Ming Studios, and Holly Hunt Upholsteries provide a relaxing place to unwind. Fido is our adored resident, too! Our on-site dog run and bath spa will surely pamper your faithful companion, offering tranquil views of the Chicago River. Immersed in natural light, our sophisticated 46th level Sky Lounge offers panoramic skyline views, a beautifully designed bar area, and elegant lounge with table seating. Enjoy spectacular sunsets from our expansive sky deck, comprised of grills, outdoor TV’s, a fire pit and casually chic lounge seating. Test your culinary skills on our well-appointed deck spaces. Farm tables provide the perfect backdrop for al fresco dining with friends and neighbors alike. Grab a blanket and cozy up to our fire pits with plush seating. Relax and de-stress in our 46th floor sauna and steam room after a vigorous workout. Watch the game while you barbecue or enjoy a movie on a warm summer night. 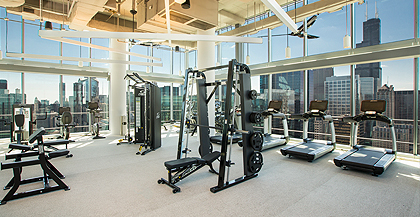 The ultra-modern, 46th floor Fitness Center will take the “work” out of your workouts with dazzling views of the city, TRX, Life Fitness and Cybex training equipment including virtual courses, device connectivity & workout tracking. Residents at Wolf Point West have access to exceptional features as well as a wide range of exclusive offers through the Magellan Rewards program. Leave it all to us. Our on-site professional management team offers decades of experience and provides you with the latest technology in resident conveniences. 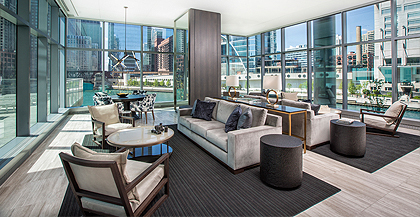 Graciously meeting the ground on the banks of the Chicago River, Wolf Point West offers a haven in the heart of the city. Our signature residential development is carefully curated for a luxurious city living experience. Wolf Point West soars above the precise location where the North, South and Main Branches of the Chicago River converge; directly across from the iconic Merchandise Mart. Live in one of the city’s most popular neighborhoods, River North, with all of the benefits of downtown living. This location serves as the heart of Chicago’s downtown with unique restaurants, shopping, boutiques and museums. Be a part of history with Wolf Point West, the first residential property to be built in the fork of the Chicago River, directly at the location that inspired Chicago’s Y symbol. Chicago’s iconic Y shaped symbol represents the three branches of the river as they converge at Wolf Point.